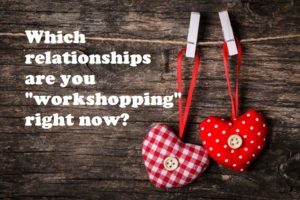 In the Relation-Shop with Dr. Shannon Warden…each episode, I’m asking you: Which relationships are you “workshopping” right now? How can I help you with that?! The relation-shop—that’s where I regularly find myself, working on my own relationships or helping others work on theirs. In fact, I often tell folks who I’m counseling or teaching that we all can and should have our own relation-shop…you know—where you keep working to understand and improve your relationships. Of course, the relation-shop is kind of like a workshop in that way. And, so for me and folks I help, I naturally think of us “workshopping” the various relationships we have. Frankly, I don’t know how the dictionary people will feel about me using workshop as a verb, but I say it anyway! Why? Because it’s fun, and “fun” is often the last thing people think about when working on their relationships, especially the more challenging moments in our most challenging relationships. However, I really do believe we can have fun workshopping in the relation-shop, and so that’s my heart behind creating and producing this new project. These first episodes aired as part of my “Relation-Shop” series I recently did through my church—Triad Baptist. Thanks to my friends Jeremy Chandler, who helped with promoting the series, and Drew Poplin, who helped video and produce the series. This is not a big-budget deal, just making great use of Facebook’s “live” feature to encourage people to stay in the relation-shop. That’s who I am—an encourager and a cheerleader for all of us as we work to have healthier, happier relationships. Thankfully, being able to encourage via Facebook seemed like and turned out to be a great opportunity. Thanks also to my special guests in each episode: Sandy Cecile (week 1); Pastor Rob Decker (week 2); Kelly Larrimore (week 3); and Gabi Reynolds, Holly Wilcox, and Joanna Yates (week 4). They brought great relationship insights and encouragement. Plus, we generally just had a lot of fun talking together and learning with each other. As always, thank you so much for your support and encouragement of my ministry. I continue to be humbled and inspired to see how God is opening doors. It is with “fear and trembling” I say to Him what Isaiah said in Isaiah 6:8: “Then I heard the voice of the Lord saying, ‘Whom shall I send? And who will go for us?’ And, I said, ‘Here am I. Send me!’” Lord, send me! I invite you to say the same thing. In whatever ways He is equipping and calling you to serve, do it! Serve! Love God and love others by serving Him! We’ll never regret that! I look forward to sharing many more episodes of “In the Relation-Shop with Dr. Shannon Warden” in the near future. Stay tuned! If you think this article and the videos may be an encouragement to others, please consider sharing it via Facebook or Twitter (see below for sharing options). For more ideas and encouragement, “follow me” @drshannonwarden (Facebook, Twitter, & Instagram). And, sign up to receive my Hope to Build On blog by email. I don’t share your email addresses with anyone, so don’t worry–you’re in good hands! Finally, scripture references in this article are from the New American Standard Bible and linked to www.Biblegateway.com.